Gaborone — Botswana is likely not to be affected by tropical cyclone IDAI that has hit the central part of Mozambique. Department of Meteorological Services principal technical officer Mr Olebogeng Molosiwa said in an interview that the so far forecast projections did not indicate the likelihood of the cyclone reaching Botswana. However, he said isolated showers in the north east region were a possibility because of its proximity to Zimbabwe, parts of which were likely to be hit by the cyclone. Mr Molosiwa said his department and other stakeholders would continue to monitor the situation as advised by SADC Climate Services Centre (CSC). The organisation has advised that national meteorological and hydrological services of Botswana, DRC, Madagascar, Malawi, Mozambique, South Africa, Zambia and Zimbabwe should monitor the tropical cyclone's progression during the next 24 to 72 hours. Tropical cyclone is an intense circular storm that originates over warm tropical oceans and is characterised by low atmospheric pressure, high winds and heavy rain. Drawing energy from the sea surface and maintaining its strength as long as it remains over warm water, a tropical cyclone generates winds that exceed 119km (74 miles) per hour. Meanwhile, CSC news release advises response agents such as National Disaster Management Agencies and humanitarian partners operating in southern Africa to plan for contingencies and rescue operations. The release further states that IDAI was moving towards the central part of Mozambique at a speed of about 176 km/h with direct and extended danger area expected to include Malawi, eastern Botswana, Zimbabwe, central-east Zambia and extreme southern part of the DRC. 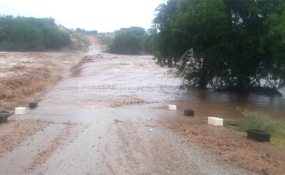 "Parts of north western, central Mozambique and north-east Zimbabwe are likely to receive increased rainfall amounts with direct impact due to Tropical Cyclone IDAI around the March 15-17," states the release. The release says the eastern part of Botswana, extreme south DRC, Malawi, Mozambique, northern South Africa, central Zambia and Zimbabwe are expected to be impacted heavily by the cyclone. The convective structure of IDAI has degraded slightly over the last several hours, with evidence of dry air intrusion resulting in a discontinuous and ragged eye wall and support a slightly lower initial intensity of 176km/h. The environment remains favourable, with low vertical wind shear and warm sea surface temperatures of 28-29 degrees Celsius, it says. However, the release says the presence of dry air from surrounding landmasses and somewhat limited outflow are acting to constrain the intensification of the cyclone. The system is forecast to continue tracking toward the east south east of coastal southern Africa while maintaining its current intensity of 176km/h with slight re-intensification to 185km/h prior to landfall beginning today, says the release. The thereafter, rapid weakening should commence, with dissipations expected by on March 17.